Despite the relatively recent commercial availability of consumer devices, various market forecasts are expecting a rapid increase in the number of users and the market value of augmented reality (AR) content in the coming years. When it comes to media consumption, the quality of the experience is the major driving factor for success, as seen in the popular mobile gaming sensation from Niantic, Pokémon Go. 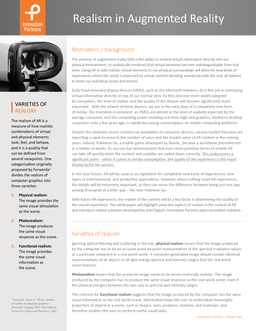 With future AR developments, the realism of the content will be a vital factor in determining overall experience quality; this white paper showcases key aspects of realism in the context of AR and introduces related solutions developed through InterDigital's Innovation Partners open innovation initiative.